Transit chief engineer Adrian Whittle says the addition of an SCR (selective catalytic reduction) catalyst and an accompanying tank to hold the system’s AdBlue liquid urea reductant is posing a challenge, not least in accommodating the components on the vehicle. On some models, he says, it will be possible to integrate the SCR catalyst with the DPF (particulate filter) but on others they will have to be mounted separately in the exhaust system. Whittle was speaking exclusively to Auto Industry Newsletter at a commemorative event marking the 50th anniversary of its Transit van and light truck range staged by Ford at its European Research and Development Centre at Dunton, Essex, UK, where over 4,000 designers, engineers and technicians are employed, albeit principally on passenger car development. 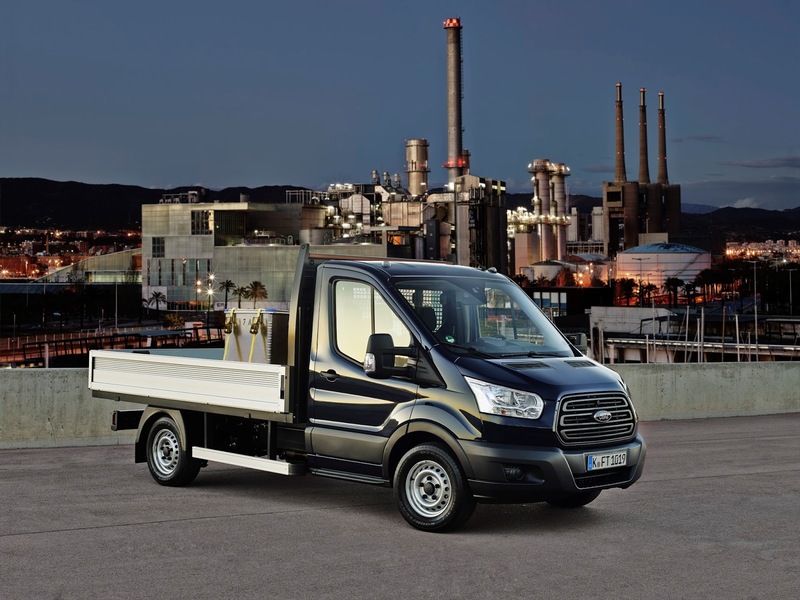 Global manufacturing capacity for the whole Transit range, including the lightweight Courier and Connect van models had now, according to Ford, reached over 600,000 units at plants in Turkey, the USA, Russia, China and the EU. That represented a six-fold increase since the introduction of the Mark 1 Transit in 1965, when production was limited to two plants in Langley, UK and Genk, Belgium. 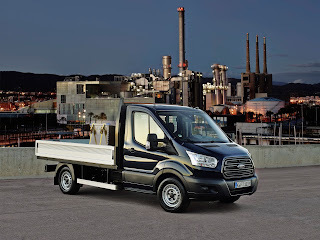 All Transits destined for European markets, including chassis-cabs (pictured below) as well as panel vans, now come from Ford’s plant in Golcuk, Turkey, following the closure of its factory in Southampton two years ago and the end of Transit manufacturing at Genk. Golcuk employs 5,000 people, though some of those are involved in Cargo truck assembly. Today’s ‘full sized’ Transit models (excluding Courier and Connect) are now categorised as the lighter Custom vans of nominal 1 tonne payload rating and the heavier-duty ‘2-tonner’, most of the latter being plated at 3.5 tonnes gvw. They correspond respectively with the original short-wheelbase LCX and long-wheelbase LCY models of 50 years ago. Many body and chassis stampings are, as with the earliest Transits, common to both types, though today’s 2-tonner is 100mm wider than Custom models. For Turkish-built Transits, those stampings are produced in the same plant at Golcuk. A small number of Turkish-built Transit models are plated at 4.1 tonnes gvw, but that could increase, noted Whittle, if there is sufficient demand in future for larger-cube van models to match those offered by competitors notably Mercedes-Benz with its up-to-17cu.m Sprinter. Currently the most capacious Transit has 15.1cu.m of load-space. Much attention has been given to weight saving in the latest full-size Transit range through the use of higher-grade steels, allowing thinner sheet to be used. Whittle highlights the use of boron steel for the forward part of the (stamped) chassis frame, to provide the now legislatively-required crumple-zone crash resistance. For North America, vans must also meet a roll-over strength standard relating to both roof and doors. An indication of the overall weight saving achieved is that for many years 3.5 tonne gvw Transit vans were nominally rated for a 1.75 tonne (originally 35cwt) payload, whereas their present counterparts can carry close to 2 tonnes. In North America, those ‘2 tonne’ Transits are built at Ford’s Kansas City Assembly Plant, where, according to Ford, they quickly achieved market leadership in their weight category, most crucially ahead of the Sprinter, marketed under both Mercedes-Benz and Freightliner marque names. A key difference between the North American and European markets for Transit is their use of all-gasoline (3.5 litre) and all-diesel (2.2 litre) respectively. The lighter Transit Custom van has yet to be introduced in North America. That segment is currently served by Ford’s long-established Econoline van range. But it seems clear that the company’s globalisation policy must point to a largely common light commercial vehicle range for worldwide markets.